Right now many of you are de-cluttering your children’s room as a part of our 91 Day De-Clutter Challenge. While we are working in our children’s spaces during this challenge, I am reminded of a topic I’ve meant to share for a long time. Sometimes, families develop patterns that can do harm in the hearts and minds of the children. Over the years, I’ve seen children made to feel useless and inadequate for not being able to keep a clean room. Usually these situations are complex, with lots of layers, and I don’t pretend to know your personal circumstance, but I do know a thing or two about kids and cleaning and organizing. One time I walked into a home covered in weeks and months worth of mess and clutter, everywhere. My host was showing me around, and when we got to the kids room, she said something like “___ was supposed to clean their room, but getting him to clean his room is like pulling teeth”. The child felt embarrassed and the parent was completely unaware of her part. Since then, I’ve felt a special calling to advocate for children in regards to keeping a clean room. The following is my opinion on the subject. The whole house is a disaster. Listen: if you’ve been keeping your house a mess for years, your children have not had the privilege of witnessing how messes get cleaned up on a regular basis. In your flustered state of being overwhelmed by your own mess, you are shifting the blame to your children where it does not belong. They have not been trained. 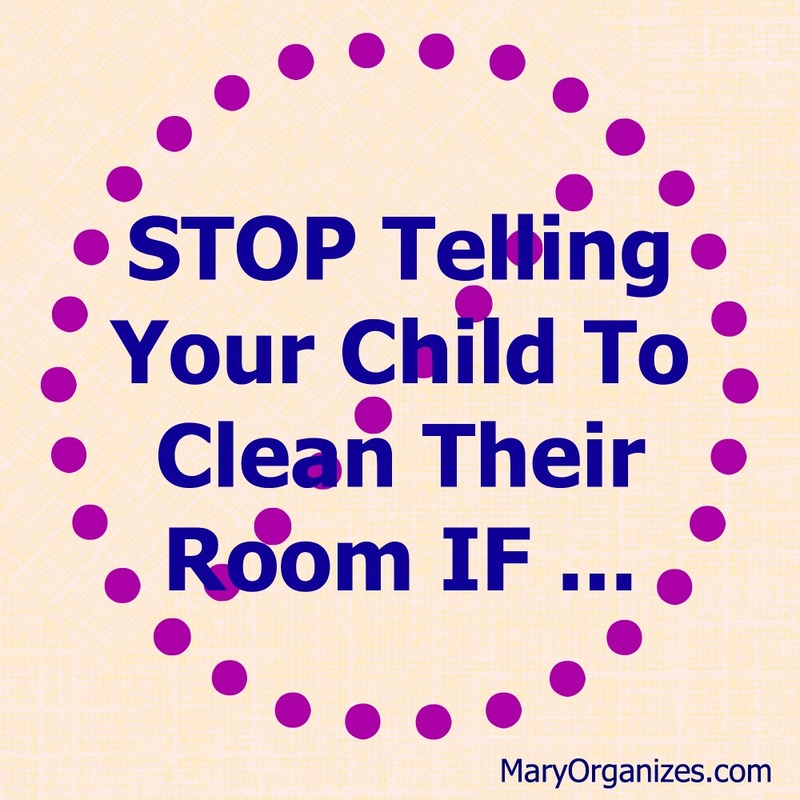 Most kids do not naturally come out of the womb understanding how to keep their room clean. It takes a lot of training, even years worth of training. It is a gift to train your children to act responsibly in their own space, because that gift will serve them their whole lives. You are just setting them up for failure to send them off to clean unprepared. You’ve left a whole bunch of junk in their room that doesn’t belong to them and they don’t know what to do with it. This should be self-explanatory, but it isn’t to everyone. Expecting a child to clean and sort around YOUR JUNK is nuts. You are trying to keep too much stuff in their rooms. You need to regularly de-clutter your child’s room with them, they need to learn that things come and go, and become accustomed to that flow. There aren’t organized systems setup in the room or in other words, they don’t know where things go. Organized systems don’t have to be fancy, they can be bookshelves, baskets, drawers, etc. It just comes down to everything having a set place to go! Less is more is especially important for any kids who suffer from attention disorders. They have an even more difficult time coping in an over-cluttered messy space. Disclaimer: KIDS SHOULD CLEAN THEIR ROOMS. Hopefully, kids are trained and given the fitting responsibility of taking care of their own space. Next week as we wrap-up our weeks de-cluttering our kids’ rooms, I am going to share strategies for keeping the rooms under control moving forward. Right now focus on getting to a good place for a fresh start. One thing to keep in mind, and I don’t know how eloquently I can express this but sometimes when children are in the middle of play, with toys, animals, drawing, etc. sometimes they leave one activity to move to another, but that doesn’t always mean they are finished with the first activity. They may be leaving their Barbies for a bit, but sometimes they haven’t mentally finished the activity. Barbie may have been just about to take her puppy to the pet hospital, but if the activity gets cleaned up and put away, then it’s like pulling a bookmark out of a book and slamming it shut and never opening it again. Sometimes it’s okay to leave the dinosaurs who have been left in the middle of a tea party and let them not be cleaned up while using parental digression to decide if the imaginative play has or should come to a close. I don’t know. Just my two cents. 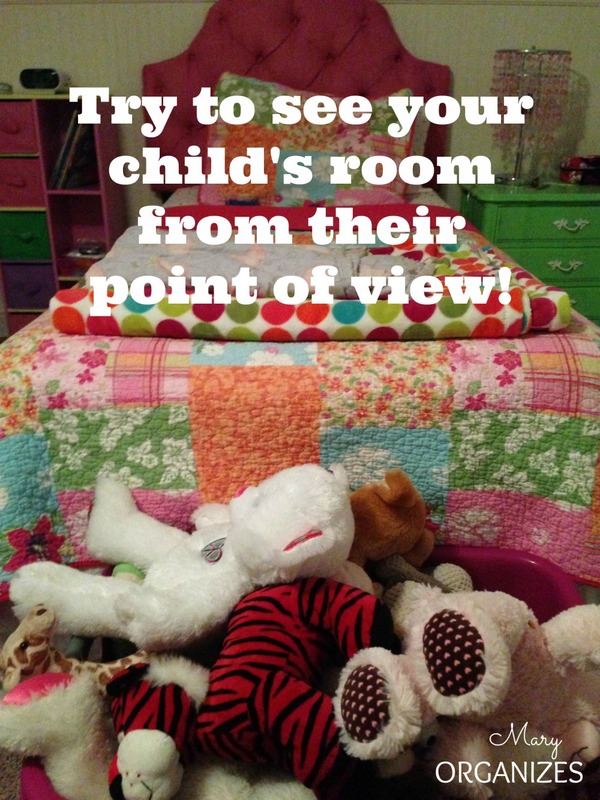 I just think that it goes along with seeing your child’s room from their point of view. And I love all the happy bright colors in your child’s room! I read what you meant and didn’t even notice! My girls are supposed to cleanup one mess before they start the next, but that is left up to their definition of “being done”. The girls are always combining toy sets with their creative minds. I love the stuff kids think up! Awesome point. Never thought of this. I often beat myself up over things I do or don’t do as a parent. But reading this post made me feel so much better. Thank you. I’ve never scolded my kids for their rooms being messy. I consider it a partnership. I make sure there’s no too much stuff in there and help them as they help me around the house. Their rooms should be their sanctuary and I truly think they already are. My room is my sanctuary and I think the kids should feel the same too. Thanks for taking the time to comment! I really needed to hear this right now I am a mom of 5, my eldest just turned 8 and I don’t think I have ever trained him to clean his room the way it needs to be done yet I expect him to do it. I feel awful. You would think I would realize that perhaps he did not know how but I just kept thinking he didnt want to which may be part of it but I dont think he knows how completely either. You may want to consider investing in a local professional organizer. We don’t just clean up people’s homes, we teach them how to organize their home. If you’ve never been trained, it would be a good opportunity to learn the skills you need. 🙂 I know that being raised in a home like this would be very tough. I applaud you for your desire to break the cycle!! I was one of those kids who was never able to clean my room and I honestly didn’t know how and I vaguely remembered my parents taking the time to show me once and then I was scolded for years afterward because I was never able to clean it again. Just because they showed me once didnt mean that the same things applied to other toys and games and books, etc. They would always say “you’re old enough to know by now” and never take the time to show me, or make the “clean up now or you’re going to have to do it with daddy and that wont be fun!” and it would be like this punishment/embarrassment thing that my dad would have to come in and sit on my bed and dictate to me where each thing would go which happened several times growing up. There was one time when my dad helped me get my room all clean and then the next day moved all these other things into my room so he could have a clean living room and then my room was a disaster again with no place to put all the new stuff. It was awful. Reading this was extremely validating for me and all the bullet points brought up in this article in my house growing up were 100% true for me. The rest of my house was a disaster, my parents were constantly putting other stuff in my room, there was too much stuff, I had no idea where it all went and there was no system at all for where things went. Thank you so much for writing this! Spot on! Funny how you posted this. Me and my daughter go round and round. I just told her today that unless my designated area is clutter free I will still ask her to clean her room but it won’t be an issue. We will work together. Was very freeing to see my hypocrisy. Thanks so much for sharing your perspective. I know that you are not alone, but starting to understand is a great break-through! This article and the comments actually brought me to tears. Growing up our home was a cluttered, bordering on hoarder-disaster and yet we were constantly scolded for not cleaning our rooms. My husband was raised in a very different, more organized atmosphere. I have always felt inadequate as a house-keeper and I have worked very hard to change the standard in my own home, but it is difficult to maintain a clean/organized home when not trained to do so. I have come a long way, however my children are on the verge of becoming adults and I know I have done a disservice to them with my lower-than-clean/organized standards. We are currently working with our ADD daughter to improve her organizational skills. We recently decided that we need to move in baby-steps. We are asking her to bring all dirty clothes to the laundry area on a daily basis. Once this goal becomes a habit we will tackle a made bed. Then we will move to keeping the “edges” of her room decluttered. I feel that we will be helping her without overwhelming her. I have been on a mission to declutter my home (we took care of the basement this summer – a huge problem in our home.) I teach and I am attending college, which means I’m working about 80 hours a week, but my goal for Columbus Day weekend is cleaning our closed-in porch – another major clutter area in our home. I am hoping that by next summer I will be completely decluttered. I am so tired of all of the “stuff”. I don’t typically have time day-to-day to face the clutter challenges, but I’m using them as lessons for what do when I have a few minutes to spare. Thanks for the inspiration. Great article. I would add. *Stop telling them if you don’t build a clean up or reset time into playtime. *Stop telling them if they don’t learn donating when they have more than what fits into the toy storage. Great add-ons. Thanks for sharing! Even with older kids, be specific. “Clean your room” is a fairly abstract concept that sounds like it will take AGES. “Put all your pens in the pots”, “hang your clean clothes and put the dirty in the laundry bin”, “put your cuddles back in the tub” are finite tasks that sound manageable. My 11 year old is getting the hang of it, but until recently if she needed to do a big clean I would make a checklist of every little bit. It takes a long time to write the list, but if I wade in and start doing it with her she won’t learn to manage herself. I have used this “divide and conquer” method with my kiddos for a while. It is definitely much better than just telling them to clean their rooms. With my older boy (8 yrs old), I will often tell him that I just want stuff off the floor, and I leave it at his discretion as to whether it gets piled together in one huge bin or whether he takes time to organize it into the “designated” bins (he has about 5000, maybe more, legos that are sorted in bins by color), after all, he’s the one who has to search for the item he’s looking for if he chooses the single bin. I love your approach! And I totally agree – letting him decide if it is worth it is great. Thanks for sharing! “cuddlies” that should have said – she has her plush toys in a pop-up laundry basket. That is my problem creating a system. I was a nanny is a SUPER organized house and I kept it Super organized no problem! I loved being there more than home. If something is organized I can keep it organized. But I can’t for the life of me “create” organization!! My best advice would be to focus on creating one organized system at a time. And follow along in the declutter event first, because that is the best place to start! We should be very careful when we start teaching our children how to clean their room. We should teach them how to be responsible but without make them feel guilty or cause them any stress. Love this article! Incredible advices! What can I say? I have three-year-old daughter and I am trying to teach her how to keep her room neat and tidy but I am afraid because I don’t want to stress her or make her feel guilty. Thank you for the detailed and interesting article! Even though u may sound a little harsh, you are totally right and I really needed to hear that. #1&2 I am definitely guilty of and am glad this article pointed it out to me. I’m one of the lucky ones, I think my 6 year old son was born with the tidy gene. He loves putting things away, but we have encouraged and taught this from the beginning – playing the “tidy up” game when he was toddler, and making games out of who can fold the most laundry the fastest, choosing “little kid” toys to donate now that he’s a “big boy”, etc. But we don’t battle over a clean room. Sometimes the legos or other toys are on the floor for days at a time as he builds, takes a break, and returns to it. And sometimes I find him lining up his socks in his sock drawer! 🙂 Its all good. As long as his room is safe, fun, and not dirty (rather than untidy), we are all happy. I have some born with that gene and some not. It is such a blessing when it works out because it takes the pressure off having to start from square one when teaching. Just keep monitoring and lovingly coaching. As you build his confidence with his organizing abilities, you’ll find that he is still teachable about it. Now for the kids who are born with more to learn. It is still possible to teach them how to be responsible in their spaces! Years ago I taught my 5 how to make beds, put away laundry and tidy up rooms. Then every morning I would remind them: Bed, dresser, desk, floor? Meaning, bed had to be made, clean laundry in the dresser, school work off the desk and into the backpack and “stuff” off the floor. I did NOT look under the bed or in the closet. Their problem if they stuffed their favorite shirt under the bed and couldn’t find it for a week. However, we did not have the toy explosion most kids have now. In order to teach them to clean the room, you have to be willing to accept that it will take more time to teach them than it will for you to do it yourself, and you have to be prepared to accept “good enough” rather than perfection. Very good advice and I think that is hard for many people — that it will take longer to teach and that even when you teach, it will not be perfect! What’s your opinion on this? My 3 daughters share a room. 9,8 and almost 2. I have tried endlessly to get the older girls to clean their room and my youngest daughters toys are in a seperate room so I make bubbas bed and clean her clothes so the older 2 are only responsible for their stuff. They have very minimal stuff as we don’t like to overwhelm them with stuff. They each have a toy box and a shelf to put their stuff so it’s very simple and they know where it all goes but constantly their clothes and toys are on the floor. I have been keeping my 2 year old out of their room so she doesn’t get into their stuff but I’ve had enough of chasing her out of her room so I’ve told the girls that I’m not going to keep her out anymore, it’s her room too and if they want to keep their stuff on the floor and bed and if bubba gets to it than that’s just too bad. I have a very clean house and have always taught them about organisation so I often wonder if I have too high expectations but expecting my 2 eldest daughters not to have stuff all over their bedroom floor is not a huge ask especially as they sleepwalk and I worry they will hurt themselves. Your opinion would be great. I took this stance a while ago. My whole house is a clutter disaster area. My children have grown up with pack rat parents. How can I expect them to be otherwise? We are tackling their rooms and our common spaces together. I don’t expect their help in my room or my craft closet–unless they WANT to. I want to help them / have them help me conquer our chaos & clutter. So i look forward to decluttering and THEN to organizing!! They will probably want to help you, because exciting changes are happening at your house. Kids maybe can’t explain how their space is making them feel, but there is not doubt that they feel better in a clean space!